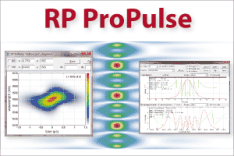 A fundamental soliton is an optical pulse which can propagate in a dispersive medium (e.g. an optical fiber) with a constant shape of the temporal intensity profile, i.e., without any temporal broadening as is usually caused by dispersion. This can happen when the pulse has a certain shape and an energy which is determined by the parameters of the medium (in particular, by the dispersion and nonlinearity) and the pulse duration. A higher-order soliton is a soliton pulse the energy of which is higher than that of a fundamental soliton by a factor which is the square of an integer number (i.e. 4, 9, 16, etc.). The temporal shape of such a pulse is not constant, but rather varies periodically during propagation (see Figures 1 and 2). The period of their evolution is the so-called soliton period. Figure 1: Temporal evolution of a third-order soliton. 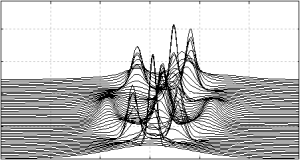 Figure 2: Spectral evolution of a third-order soliton. Figure 3: Temporal evolution of a third-order soliton. The color scale shows the optical power. The soliton period is 50.4 m, i.e. the displayed range corresponds to about two soliton periods. 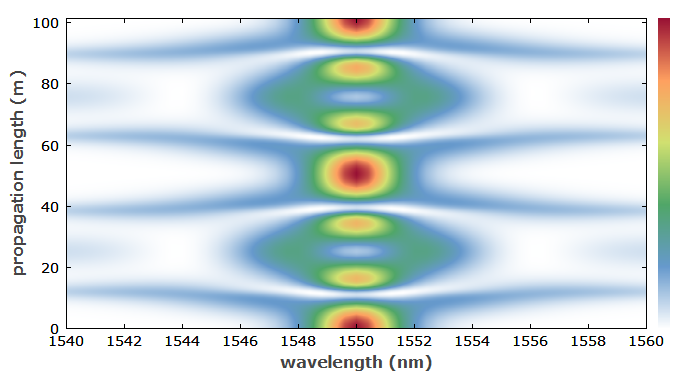 Figure 4: Spectral evolution of a third-order soliton. The color scale shows the power spectral density. 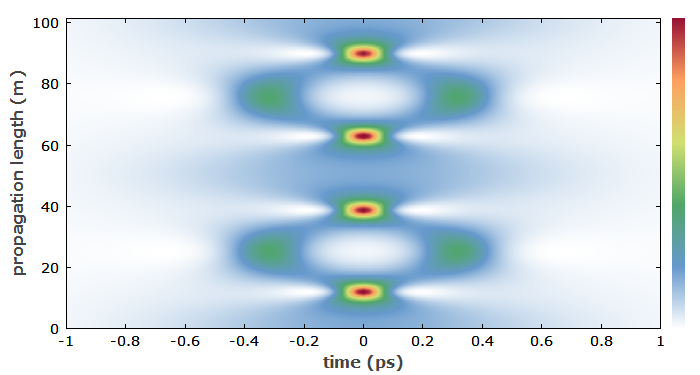 Higher-order solitons can be used for nonlinear pulse compression: a sech2-shaped pulse with a suitable energy, injected into an optical fiber with anomalous dispersion, can evolve as a higher-order soliton, and after a certain propagation distance the pulse duration can be substantially decreased. 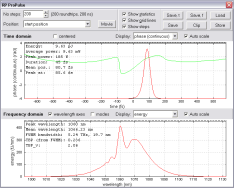 High soliton orders allow for strong compression, but also lead to a critical choice of the pump wavelength. Whereas fundamental solitons are usually fairly stable, higher-order solitons can break up into fundamental solitons under the influence of various effects, such as higher-order dispersion, Raman scattering, or two-photon absorption. Such soliton breakup sometimes plays an essential role in the process of supercontinuum generation in photonic crystal fibers.